Gloxinia brings a truly exotic touch to the landscape with its vibrant orange, tubular flowers set off by big, glossy, deep green foliage. 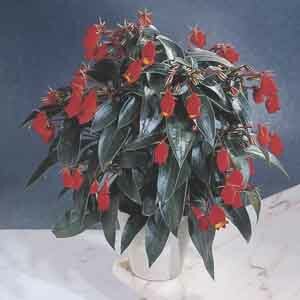 Excellent for growing in containers outdoors or can be grown indoors in a bright location. Grown as a perennial in frost-free climates. Perfect for beds and borders or as a potted plant indoors or outdoors. Apply an all-purpose fertilizer according to package directions. Plant in well drained soil, water and fertilize regularly.